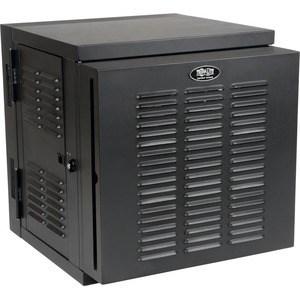 The SRWX12USNEMA SmartRack® 12U IP54 Switch-Depth Wall-Mount Rack Enclosure Cabinet is designed to house standard 19-inch (48.3 cm) rack equipment in harsh, dirty work environments with limited floor space, such as factories, construction areas, utility plants, power stations, transportation terminals, distribution hubs and warehouses. Constructed from heavy-duty steel with a durable black powder-coated finish, the cabinet has a maximum load capacity of 200 pounds (90.7 kg). The SRWX12USNEMA has an IP54 (NEMA 12) protection rating, protecting sensitive equipment against dirt, dust, lint, oil, drips and splashes. Its built-in air filters, louvered vents on the front door and side panels, sealed gasket around the door frames and brush strips around cable access points prevent dripping water, oil and airborne contaminants from getting inside. You can replace the air filter with standard, off-the-shelf furnace filters. Four high-performance intake fans built into the front door pull filtered air through the cabinet to keep your equipment cool. The cabinet swings away from the wall on a sturdy hinge, allowing easy back-door access to equipment and cabling during installation and maintenance. The reversible doors can open left or right. The doors and side panels lock securely to help prevent damage, tampering or theft. Convenient ports on the back door allow easy cable routing. The SRWX12USNEMA comes fully assembled and ready to mount to the wall. Square mounting holes and numbered rack spaces make equipment installation easy. The adjustable vertical mounting rails house equipment up to 20.5 inches (52.1 cm) deep, such as network switches and patch panels.